Normally, a 40-year-old sandwich would be something to be avoided. Unless you're one of millions who flock to McDonald's each year to chow down on a Big Mac. The triple-decker burger, which helped breed America's super-size culture and restaurants' ever-expanding jumbo meals, is turning 40. For some fast-food junkies, that's cause for celebration. "The flavors that come together — it's like heaven in your mouth," said April Kohlhaas, a 31-year-old Chicago resident. "It's just tradition, like American comfort food." The Big Mac was first introduced in 1967 by Jim Delligatti, a McDonald's franchise owner in Uniontown, Pa. A year later, it became a staple of McDonald's menus nationwide. Indeed, the sandwich has become a veritable pop culture phenomenon, spawning everything from an impossible-to-forget jingle ("Two all-beef patties, special sauce, lettuce, cheese, pickles, onions on a sesame-seed bun," anyone?) to a currency-evaluation index created by The Economist. Along the way, more people in more than 100 countries have given in to Big Mac attacks, according to Oak Brook-based McDonald's Corp.
"The Big Mac is certainly one of our most popular sandwiches," said spokeswoman Danya Proud. "There is only one Big Mac and there will only ever be one Big Mac." 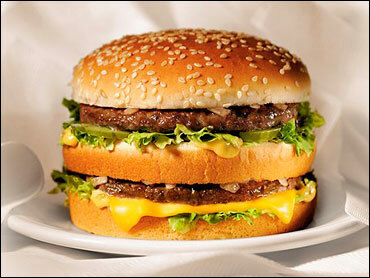 McDonald's estimates 550 million Big Macs are sold each year in the U.S. alone. Do the math and that's about 17 per second. Weighing in at nearly a half-pound, with 540 calories and 29 grams of fat each, that's enough to make nutritionists cringe. "When it was eaten once in a while there wasn't anything wrong with it," said Marion Nestle, professor of nutrition and food studies at New York University's Steinhardt School of Culture, Education and Human Development. "It was just fast food, something fun once in a while. But then it became everyday fare." Andrea Hawkins had her first Big Mac in high school and likes the treat so much she started a "Big Mac-aholics" group on the social networking Web site Facebook. She has put her Big Mac attacks on hiatus while she gets ready for her wedding next month. But that's not stopping her friends from building a cake-like tower of McDonald's hamburgers for her upcoming bachelorette party. At the top, of course — a Big Mac. "(The) first treat on the way to the honeymoon will be a Big Mac," jokes the 25-year-old from Dayton, Ohio, who prefers hers without cheese. Love them or hate them, the Big Mac has grown from its humble beginnings to become a cultural unifier, said pop culture expert and author Rachel Weingarten. "You can live in Beijing or Brooklyn and you can enjoy as your favorite snack a Big Mac attack," she said. "Maybe you didn't grow up watching the same cartoons, maybe you didn't grow up speaking the same language, maybe you grew up next door to each other and never said hello, but you suddenly have a point of reference — this warm, yummy, bad-for-you, sometimes-naughty thing."